Articles include -- Reunion by Gary Swisher - Dr. Arid Reports on Deep Springs Fundraising - A Crucial Stage by Bob Aird - L. C. Report by Migué Dozier - Pat Schrock Memorial Fund by anon. - ApComm at Work by anon. - Dairy by Jordan Greenwald - King Henry IV, Part I by Grace Mansfield - Academics by Stephen Brooks - Telluride Convention by William Ragen - An Historical Footnote [re Main Room furniture] by Chet Dunn - A Comparison of Deep Springs and Telluride House by Thomas Smith SP74 CB75 summer guest DS76 - Special Thanks by Verda Norman, relative of Pat Schrock - etc... [thanks for sending news] by anon. - NEWSNEWSNEWS...by anon. - List of Current Student Body by anon. 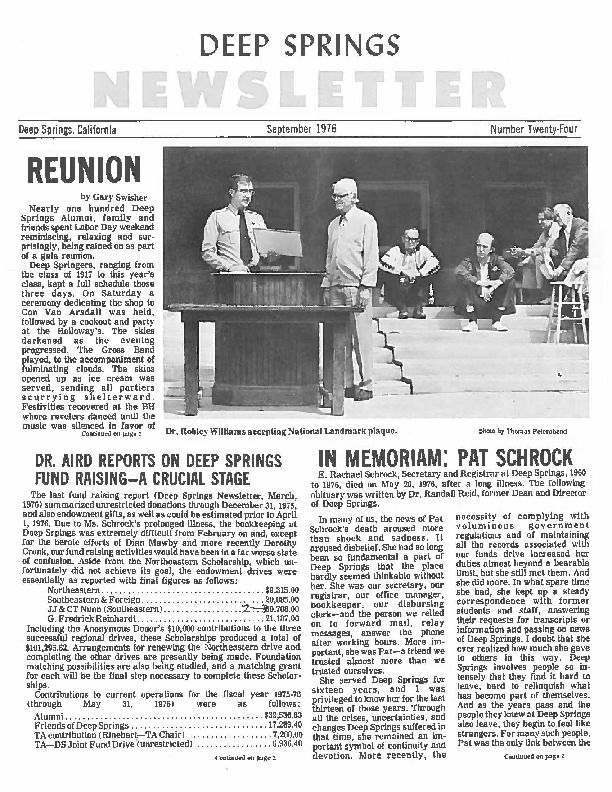 Deep Springs College, “DS Alumni Newsletter September 1976,” Deep Springs Archive, accessed April 22, 2019, http://archive.deepsprings.edu/items/show/1298.